After my lecture on influenza pathogenesis and evolution at the Northeast Laboratory Conference 2010 in Portland, Maine, I was asked if it is necessary to receive the influenza vaccine every year. This question was precipitated by my statement that the 2010-11 trivalent influenza vaccine contains the same swine-origin H1N1 strain as last year’s monovalent vaccine. That virus has not undergone sufficient antigenic drift to necessitate the formulation of a new vaccine. Also made available last year was a monovalent vaccine comprising the pandemic strain, A/California/7/2009. 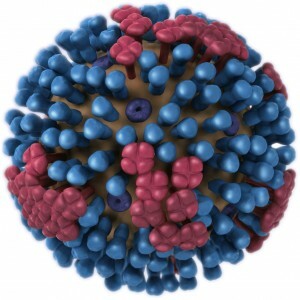 The seasonal H1N1 strains of previous years are no longer circulating and have been eliminated from the vaccine. If you received last year’s seasonal vaccine and the monovalent vaccine, is it necessary to receive this year’s vaccine? The answer is yes, because the H3N2 strain is different – last year the vaccine contained a Brisbane strain while this year’s H3N2 isolate is from Perth. The full WHO report on strain selection is available as a pdf document. What would be the answer if this year’s trivalent vaccine were identical to that used last year? The answer would still be to receive the vaccine, because the duration of immunity provided by the inactivated influenza vaccine has always been an issue. In elderly recipients (>65 years of age) immunity barely lasts for a single influenza season. Younger recipients will likely be protected from disease for one influenza season, and perhaps a second season as well, although in the latter case a milder respiratory disease may result. For these reasons the CDC recommends annual immunization against influenza virus for all individuals 6 months of age and older. The current inactivated influenza vaccines were developed during World War II, and although they have since been refined and purified, there are still deficiencies, including brief duration of protective immunity. Development of new influenza vaccines that not only overcome this problem, but also provide broader protection, is clearly needed. *This post, like everything else on virology blog, does not contain medical advice. It comprises scientific information about the vaccines which can be used, together with your health care provider, to reach a decision about immunization. Does flu mist provide stronger and long-lasting immuity as compared to inactivated vaccine based flu shot? I have heard that vaccine virus in flu mist becomes inactive once it reaches the lungs due to higher temperature there? Is it true?